From Theatre, to to music and cinema, there's plenty to experience within the triangle of Milton Keynes, Bedford and Northampton. 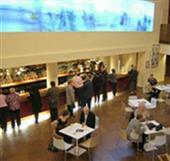 Milton Keynes Theatre is a leading live entertainment venue featuring West End and touring productions. The varied programme includes quality dance, drama, musicals, opera, comedy & children's shows. After its £15 million redevelopment project, Royal & Derngate offers a diverse programme from drama to dance, stand-up comedy to classical music, children’s shows to opera. Some of the biggest names and shows, as well as widely acclaimed in-house productions in Nothampton. As seen at the Big Olney Food Festival 2009. One screen cinema which offers 'the best in world cinema'. Located in Northampton. One of the original cinemas in Milton Keynes, located inside new city landmark "The Point". Modern cinema situated inside the Xscape building, on the first floor. Plenty of cafes and restaurants near. Performances of the Milton Keynes Theatre of Comdey are put on at this theatre on the Camphill site. The Stables is one of the country's top live music venues, with performances for all tastes: jazz, blues, folk, rock, classical, pop and world music. The Castle offers theatre, cinema and arts centre. The Bedford Corn Exchange hosts live performaces of comedy, theatre and music. It is one of only two UK residencies of the Philharmonia Orchestra outside London. Cinema with many free parking spaces nearby and plenty of restaurants close by on the Sixfields site too. 10 screen cinema in Northampton. Mutliplex with plenty of free parking. In the same location as a number of restaurants. This is a stunt horse riding team who put on show at their stables in Wychwood with their highly trained horses.